Professor Blood was a native of County Clare and was educated in Edinburgh and Trinity College Dublin. He graduated with his degree from Trinity in 1839, having obtained the College Gold Medal in Mathematics and Physics. For the next ten years, he worked as a railway engineer in the United Kingdom where he came under the influence of the famous engineer Brunel. He returned to Ireland in 1850 to take up the post of Professor of Civil Engineering at Queen's College Galway as it was known at that time. He retained his interest in railways and was noted for his contributions to bridge engineering. His analysis paved the way for the building of the Boyne Viaduct, which had the longest span in the world when constructed in 1857. 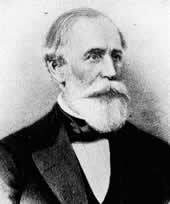 He was an uncle of George Johnstone Stoney, Professor of Natural Philosophy in Galway from 1852 to 1857 and of Bindon Blood Stoney, the famous engineer in the 19th century who was responsible for the design of O'Connell Bridge in Dublin and also for much of Dublin port. Bindon Blood resigned from his post in 1860 to look after the family property in Co. Clare, where he died in 1894.